Last week, the weather was pretty nice in Rochester, which is a reason to celebrate. I did this by walking around my neighborhood and stopped by the seafood market there. I love fresh seafood and fish, and the Pittsford Seafood Market is great. They are within walking distance from my house, so I save on gas, and their seafood and fish are very reasonably priced, so I save money as well. I bought a couple of nice tuna steaks for dinner, then picked up some fresh vegetables to make a delicious, summery and colorful meal. In a skillet, heat the olive oil. Cook the shallots and the minced ginger until the shallots become translucent. Add enough rappi to fill the skillet, allow to cook down, then add remaining rappi, if any. Add the bok choi and cook until softened. Add 2 Tbsp of soy sauce and 1 Tbsp oyster sauce and mix while vegetables cook. Keep warm on low heat until ready to serve. Pour the sesame seeds into a shallow bowl or dish. Cover all sides of the tuna steaks with the seeds. While you do this, heat a frying pan over high heat. When the tuna is coated, place large, flat side down on pan and cook until fish changes color about 1/3 the way up. Flip the tuna over and cook the same. Remove from heat and cover with aluminum foil to set. While the tuna sits, make the sauce. Mix the remaning soy sauce, oyster sauce, ground ginger and pepper in a bowl. Arrange the food to be served. 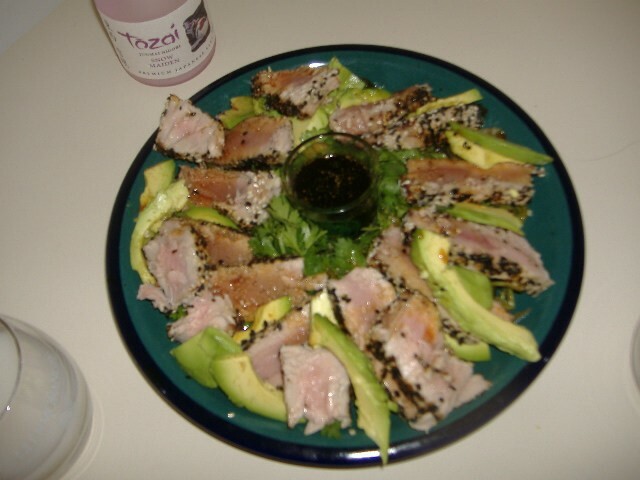 Put down a layer of the cooked rappi and bok choi, then arrange alternating slices of the avocado and the tuna. Rip off a handful of washed cilantro and put that in the center of the tuna and avocado, and mix in the minced serrano pepper. Drizzle a couple Tbsp of the sauce over the food and reserve the rest for dipping. I really liked the combination of the avocado and the seared tuna, but it doesn’t take too much to convince me on seared tuna. I thought that the slightly bitter rappi and bok choi really complimented the tuna. The cilantro salad also adds a degree of freshness and a bit of heat from the peppers. I served this with unfiltered sake, which is very sweet. I would change this the next time, for something not as intense. The boyfriend came up with the clever idea of putting the sauce in the shot glass and nestling that in the cilantro salad. It made for a nice presentation.